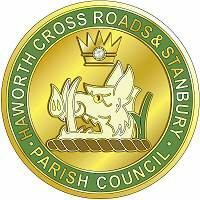 Please Note: The Parish Council minutes in electronic format may have errors and omissions, and in some instances the Minutes may be waiting approval by the Council. Only the signed copy of the minutes will be accepted as the true minutes of the meeting. A public meeting will be held on Wednesday 9th January 2013 at 7.30pm at West Lane Baptist Church. The closure of Haworth Fire Station has been deferred for a maximum of two years to allow for a detailed feasibility study. At this meeting called by Haworth, Cross Roads and Stanbury Parish Council the future of Haworth Fire Station and a proposal to form a ‘first responder-style’ emergency cover service will be discussed. Please give your support by attending the meeting. Contact details for the Clerk to the Parish Council added. The Parish Council is now facing up to its biggest challenge since its formation ten years ago. Following a year when a General Election brought a change in Government, we have been faced with a root and branch change in financial policy. The Coalition Government have taken an axe to the nation’s central spending patterns and put in its place a completely new ethos based firmly on the Prime Minister’s ‘The Big Society’ theory. Details of what this will mean for this Council are still not yet in place but we are anticipating that certain powers will be devolved to us, including a decision-making ability within the Planning Sector. This will mean substantial changes for the Council and its Councillors work patterns, at least it will for those who are elected following the four-yearly election on May 5th. During the last few weeks we staged a Councillor Conference at which we debated what our Parish Council’s attitude to undertaking such devolved powers would be; tried to visualise what the impact would be on the Council and its finances and to understand what training needs would be required by the Councillors involved. It was a rewarding meeting and I believe it gave the Council a basis for undertaking whatever necessary tasks for the villages. We had been considering taking powers on the ‘Powers of Well Being Act’ on the grounds that it would have given us far more flexibility in delivering services to the Parish so this could well be a logical extension of our development. We have continued to work hard for the community. One of our biggest tasks has been working with the Neighbourhood Policing Team and Bradford Youth Services in mitigating anti-social behaviour by young people in both Cross Roads and Haworth. We have attracted £4,000 in funding various sources, including Bradford Metropolitan District Council (£2,000) and our neighbours Keighley Town Council (£1,000) for which we are truly grateful. This has enabled us to fund the opening of the Haworth Youth Club on Friday evenings and we are still working on the kind of programme that will be offered to the young people. We have been involved in preliminary discussions about the foundation of a Cross Roads Village Association and several other initiatives within the villages. One project that did not meet with universal approval in Stanbury was the introduction of planter support poles in the playground off Main Street and they are now subject to a retrospective Planning Application after several residents raised their concerns. During the Year we lost our active Stanbury Councillor Lesley O’Brien who found that her business commitments prevented her from continuing. She stood down in October and we co-opted John Suckling as her successor in January. I’d like to thank Lesley for her outstanding service to the community and welcome John to the current team of Councillors. In May we will be losing one of the Council’s original Councillors Ian Shackleton. Following a spell of ill-health he has decided not to seek re-election and we shall certainly miss him. Ian has delivered outstanding work in Cross Roads; worked tirelessly for the young people of the Upper Worth Valley and taken a special interest in planning matters. We wish him well for the future and thank him for his work for the Parish Council during a decade of service. to wish him well in the future. We have also been honoured by having our Finance and Overview Committee Chairman Cllr. Peter Hill, who is the retiring District Councillor for the Worth Valley, act as the Lord Mayor of Bradford – the second on our Council following Cllr. Barry Thorne who has also worn the District Council’s impressive chain of office. Peter, by necessity had to reduce much of his Parish Council work during the year, but provided us with wisdom, counsel and advice wherever possible. I’d like to thank him for his continuing hard work and support. We have also been busy in other areas of civic life within the Bradford and West Yorkshire area. Besides fulfilling my role as Chairman of the Parish Council, I am Chairman of the Worth Valley Joint Transport Committee and Chairman of the Parish and Town Council Group for the Liaison Group that meets Bradford Council every quarter. Thanks to some funding and a partnership with the Aire Valley Partnership we shall be reviewing the Parish Plan that was published three years ago. The whole basis on which the Plan was originally drawn up has been called into question and we have agreed to be used as the subject for a European Project study as part of the Sustainable Urban and Rural Fringe programme during the next twelve months. My Deputy Chairman Cllr. Mark Pullen has been a great source of support and has been very busy in Cross Roads particularly in leading the improvements in Cross Roads Park and he is also a prime movers in the formation of the Cross Roads Village Association. As chair of the Joint Transport Committee I have been a party to the completion of the marketing survey to test whether there is a desire for the return of community services on the heritage steam Keighley and Worth Valley Railway while we are also monitoring the effect of the public service budget cuts on our bus network. Cllr. Pullen represents the Council at the Yorkshire Local Councils’ Association South Pennine Branch meetings. Cllr. Alan Watts is our delegate to the Bronte Country Partnership, a marketing body while Cllr Rosemary Key is chair of the Worth Valley Police and Community Contact Point Management Committee and also a Governor of Lees Primary School. We thank them for the time, energy and commitment. Our long-serving clerk Glyn Broomhead remains a central pillar of the Parish Council’s activities, while Mags Smith is now in her second year as the Co-ordinator at the Contact Point in both Haworth and Oakworth. I’d like to thank them for their support and efforts on our behalf during the last twelve months. I would also like to offer my thanks to all the Councillors for their service during the last 12 months and their civility within our meetings. I believe we have done a good job in 2010 – 2011. It has been a busy, successful year for the Parish Council but there is no room for complacency. While the future looks to be challenging, there is the potential excitement of us becoming more involved in the destiny of our section of the Upper Worth Valley. The last twelve months has offered a variety of applications to be considered by the sub-committee ranging from minor changes to properties through to new builds and potentially major changes. Foremost in the minds of those attending the meetings are the consideration of the community and the impact any change, no matter how small, will have on those who live, work and play in the villages. In addition to making recommendations to the planning department, we are also looking to use the parish newsletter to inform local residents of the requirements to investigate further any changes they are hoping to make to their properties to ensure that, if necessary, the correct applications are submitted. The national Government is currently proceeding with major changes to the accountability of the various tiers of public office, and it is likely that this will be reflected within this sub-committee in the shape of additional powers to actually make decisions on smaller applications. These new powers will likely bring a greater responsibility to those serving the community and this means that the working relationship with the existing planning department in Bradford will become very important to ensure that fully informed decisions are being taken. Cllr Shackleton mentioned in his report as the previous Chair the progression of accessing applications via the internet, and we have been working in partnership with Bradford MDC to take another step forward which will allow applications to be viewed digitally at meetings – this will be achieved by projecting the plans onto a suitable screen for the benefit of those present. It won’t be 3D at the Ritz but still a positive development. The contact point is maintaining visitor numbers, unfortunately too many regarding clamping. We have had a good year thanks to Margaret Smith our co-ordinator. We had a successful social event at the youth hostel to thank our volunteers and our loyal team of newsletter distributors. At our annual cheese and wine party at Christmas a presentation was made to P.C. Mick Exley who has retired. Mick was the Police representative for the Contact Point, unfortunately due to police cuts he has not been replaced. Sadly in December Annie Harker, our oldest volunteer, passed away. Annie had been a volunteer since the opening of the Contact Point and several of us were able to attend her funeral, which I think was a comfort to her family. Another sad event in January was the death of Private Martin Bell who was killed whilst serving in Afghanistan, Martin was a PCSO in the Worth Valley team for three years before joining the Parachute Regiment two years ago. David and I represented the Contact Point and of course Peter and Gill Hill, as Lord Mayor and Lady Mayoress, attended his very moving funeral at Bradford Cathedral. Shortly after the start of the new Council year, the new model Parish Council Standing Orders were approved by the F&O Committee and adopted by the Council. This also included our own financial and planning regulations as previously amended which were tied into the pagination of the new standing orders. The F&O committee recommended a number of grants during the year –as laid out in the annual accounts, all of which were subsequently ratified in Council. The planned expenditure on public seating is going ahead at long last after lengthy negotiation with Highways, Street Scene, Parks & Landscapes and The Countryside Service. These are now on order and will be installed shortly. Our insurance is now entering the second year of its two year agreement, after which it will be reviewed. The Council risk schedule remains robust and staff contracts of employment have been amended where required. There is still some work to do on internal auditing which will be put in hand at the beginning of the financial year. This year saw a further small increase in the annual budget. The increase agreed resulted in an additional 44p a year for a Band D property, to cover increases in salary, audit and YLCA membership. The Stanbury Lengthsman’s hours have been reduced as a cost cutting measure. £3,000 is to be drawn from reserves to provide better youth provision under the Kidz R Worth It scheme and Friday Youth Club. It is the F&O committee’s opinion that the Council has been run prudently in the past year. Finally, I would like to thank the Parish Clerk and the members of the F&O committee for their work during the year and also to wish Cllr Jolly well on his retirement from Council this May. Over the past year the group has liaised with the Highways Department and has obtained approval for the siting of two boundary stones. Negotiations are proceeding to have the stone plaques on the stones to be engraved. Approval has also been given for a number of road side planters to be placed at locations around the parish. Planter trees were erected in Stanbury Park. There has been some discussion as to their appropriateness in the village environment and it has been agreed to hold a public meeting later this year to reassess the affair. A submission for a grant from the Big Lottery Fund was made for work on bat indicator species conservation. This was refused on a technicality – we planned to distribute bat boxes, which is apparently against the rules. We are now discussing with the Haworth Village Association the option of a co-operative venture on similar lines. Very successful schemes were run during the school holidays at Easter, Summer & October half term 2010. The management structure of the Working Group has been modified to include formal representation from Oxenhope PC and to bring us into accordance with current regulations. We are involved in planning for an application for Charitable Status that may result in the group becoming an independent company with ties to the PC. The details are still being examined. We intend to run the scheme this year although the calendar is yet to be finalised being dependent on funding.